Wow, after thinking my iPhone was a great traveling companion for navigating the highways and biways of life and finding points-of-interest, I am quite happy that I decided to give a device engineered specifically for the task a go. 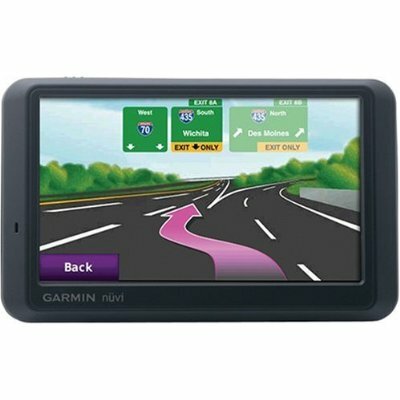 The Garmin nüvi 765t 4.3-Inch Widescreen Bluetooth Portable GPS Navigator is the product I went with after doing a lot of reading and sending a note out to my FB friends. I was originally leaning toward the Garmin nüvi 265WT but a recommendation and further review resulted in a change in direction. I’m happy I did change my mind. When it arrived I was wondering if maybe it was a returned product as the packaging didn’t look as fresh as I would have expected. I’m guessing it was new and I did keep it and get it charged up and in the truck and all seems good. First impressions? Totally awesome. My son, Harrison, and I took it along to go to the mall so he could buy a birthday gift for his sister, Madison. Yes, I know how to get to the mall but one must play with their toys. I was amazed at just how well it tracks your location, notifying you in advance of the next turn’s direction and then again right before the turn. On another trip I went to pick Harrison up at a friend’s house. I typically take a back way but find that, not being really familiar with the area, I tend to miss a turn off, especially at night. So, I programmed in the address and set off. What did I find? The device didn’t want to take my back way. I haven’t researched it much yet to figure out if it was providing the quickest route or if there is some other algorithm going on. I figured this was the perfect opportunity to test out the ability of the device to re-calculate the route. What did I find? It was still trying to get me back to the path it originally computed. Not too surprising really. On the trip back I, again, decided to take the back roads. Again, I had to get quite a ways down my route before the Garmin finally gave up on taking me on its original plotted course. But it finally did come around to my way of thinking. What do I think of all this? I suppose I’m okay with it but my concern would be that if I see traffic on a city street that I want to avoid, I’d like to think if I take a side route that the re-calculated route would keep me more on that route. (of course, it could just be me needing to learn how to use this thing better). So, at this point I’m still very happy that I went with this model. I am definitely a Garmin fan, so that factored into going with one of their products. Now for the downside. Part of the thinking that went into the selection of this product was that I wanted to use the bluetooth feature so that I could use my iPhone in a handsfree manner. While I have been able to pair my iPhone with the device, multiple times, whenever I go to use the Garmin it pretty quickly throws a message that the bluetooth connection failed. I had read some reviews of folks mentioning this issue but my recollection was they got it working. The iPhone is on the list of compatible phones. I do plan on working on this issue more and will update this post with the results but I’m a bit displeased that a common feature, which isn’t new technology, isn’t working more easily. I really hate spending time dealing with issues that shouldn’t be issues. I also need to see how some of the other features work. At first blush the traffic map seemed a bit off when driving over the San Mateo – Hayward Bridge the other day but I haven’t played with that too much. I also haven’t tried having the system work over the car’s speakers and I need to find the best way to mute the instructions when I’m on a section of a trip that I know. As you can see, I’m still playing with this but wanted to share my first impressions. Hey, if you tend to lose your car when you go somewhere, this unit can mark it’s location when you turn it off and throw it in your pocket. Now that may be worth it right there. The complete lowdown on this unit can be found on Garmin’s site. Feedback on your Garmin Nuvi, Jack has the 750 and it does have a settings if you want to avoid highways, go the quickest way etc. We just got it back as it had to go to the Garmin hospital….broken screen due to travel in a suitcase….he now has a hard case for it the case I found at Staples and is a hard lockable pencil case and it fits with all the wires, mounting unit too very snug but better than another broken screen. Jack travels for a living almost every week and his bags are almost always checked ….traveling with 2 suit cases one weighing in at just under the 70lb limit is like having a large flashing light above your suit case! CHECK ME CHECK ME! It was very interesting that Garmin fixed it for a flat rate of $99.00 which is way better than purchasing a new one. He did report to me that it seemed to be functioning better (quicker response) than before not sure if they updated it while it was visiting the hospital but I suspect they did. He loves his unit it isn’t compatible with the blue tooth but it sure gets a work out and has come through with flying colors being in a different state and city almost every week is a true test of it’s ability to function at the level he needs. .-= Robyn, Maine, USA´s last blog ..Sometimes…… =-.